One of the most exciting things in Spring is waiting for the Wisteria to burst into cascading purple flowers (yes, my life is pretty exciting 😉 ) but after painting this I am pretty glad to wait another year until it flowers again. Apparantly purple is a colour linked with royalty and mystery and it is also a difficult colour for our eye to discriminate because it has the shortest wavelength in the light spectrum. I definently found this to be true while painting and comparing the flowers to the green grass! 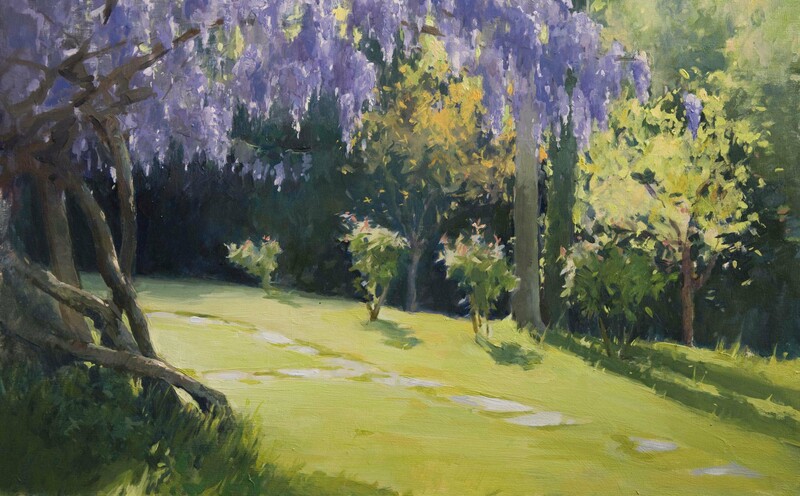 Beautiful, I love the Wisteria on the left with the purple blooms drawing your eye towards the right and then your eyes tend to travel down capturing the sun light tree then they bounce to the center highlighted area. Bright and happy piece. 🙂 I feel your happiness.. Thank you so much Isabel for taking the time and letting me know what you think, its greatly appreciated!! Once again amazed by your talent, Anna. This one is absolutely gorgeus. The light in the Wisteria is SO beautiful! Thank you so much Heidi, the light in the wisteria was hard to capture, it was far more beautiful in real life! Previous Previous post: Catching Fire. Next Next post: La Chiesa di San Pietro, Porto Venere.